Rain-X Waterless Car Wash & Rain Repellent, a state-of-the-art, exterior car cleaning product, has been voted Product of the Year for 2019. Product of the Year is the world’s largest consumer-voted award for product innovation, where winners are determined by the votes of 40,000 consumers in a national representative survey conducted by research partner Kantar. Rain-X Waterless Car Wash & Rain Repellent has been awarded the top honors for the Car Care category. 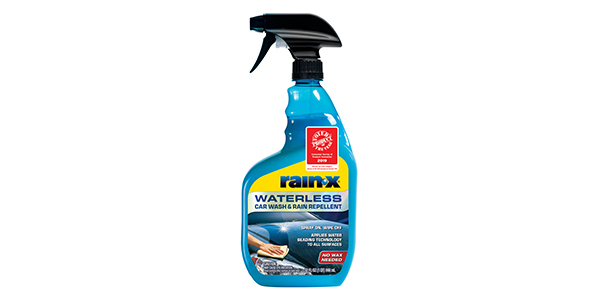 The Rain-X team spent two years developing, testing and perfecting the Rain-X Waterless Car Wash & Rain Repellent. The product cleans entire vehicles without water or a bucket and applies the Rain-X proprietary water-repelling coating to all surfaces, including glass. Rain-X was a past recipient of the “Product of the Year” award for its Rain-X Latitude Water Repellency Wiper Blades in 2017. Studies conducted by Kantar TNS show that consumers are 44 percent more likely to purchase a product awarded “Product of the Year” and 36 percent more likely to trust the products with this logo. The complete list of the 36 winning products of the 2019 Product of the Year Award can be found at productoftheyearusa.com.